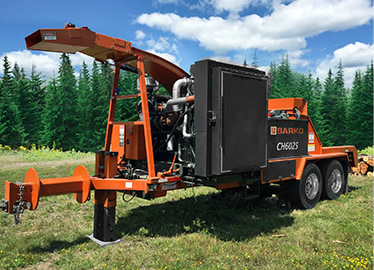 Ruggedly built and driven by a powerful engine, Barko whole tree chippers feature patented ConeHead drum technology. Unlike the chopping motion of traditional drum or disc machines, the ConeHead delivers an innovative slicing action that uses far less energy to produce more chip loads per gallon of fuel consumed. Driven by a 520-horsepower engine, the CH6025 whole tree chipper is ruggedly built with an 8-inch reinforced tube frame to handle trees up to 22 inches in diameter. The machine offers enhanced hydraulic control features and patented ConeHead drum technology for optimal efficiency in producing wood chips.